USS Pamina (AKA-34) was an Artemis class attack cargo ship named after the minor planet 539 Pamina, which in turn was named after a character in Mozart's opera The Magic Flute. After fifteen months service, Pamina was reclassified AGS-15 and renamed Tanner. Under both names, the ship served for 24 years and 4 months. 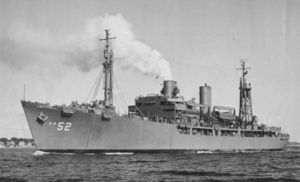 Pamina received one battle star for World War II service. 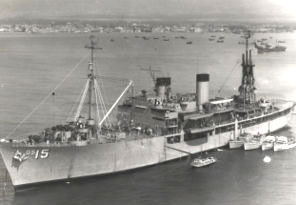 Pamina was laid down in 1944 by the Walsh-Kaiser Co., Inc., Providence, Rhode Island; launched 5 January 1945; sponsored by Mrs. Ralph M. Johnston; commissioned 10 February 1945, LCDR E. P. Teague in command. Following shakedown Pamina transited the Panama Canal and reported to Amphibious Force, Pacific Fleet, Pearl Harbor. After intensive training with other vessels of her type, she departed Pearl Harbor 22 April and arrived Okinawa 15 May to deliver important cargo and to render valuable assistance to combat operations ashore. She operated in the South, Southwest and Western Pacific areas for the remainder of World War II. Immediately thereafter she transported occupation forces to Japan and returning servicemen to the United States. Pamina was reclassified AGS-15 and renamed Tanner 15 May 1946. After sea trials during November and December, Tanner conducted hydrographic survey operations off the east coast of Mexico. She continued similar activities in the same area, off Labrador, off Trinidad and off Venezuela for the next four years. In January 1951, she began survey work in the Bahamas in connection with a guided missile testing range, work which she continued with only occasional missions elsewhere until the summer of 1952. At that time she returned northward and after a period in New York Naval Shipyard proceeded to northwest Greenland for extensive priority survey work. She concluded the season with a survey of a small island in the Canadian Arctic where a harbor was named "Tanner Bay" in her honor. From 1954 to 1958, Tanner operated primarily off the southern coast of Turkey with 27,255 miles steamed during 139 days in the survey area in the spring and summer of 1956. Again in the Bahamas in 1959, she became part of the Persian Gulf Survey Unit later that year. After extensive work in the Near East, she conducted research in the Barents Sea in 1963, in the deep dive area off Norfolk in 1964, and in the northern Aegean Sea 15 November 1965 to 15 March 1966. Tanner deployed 19 October from Pearl Harbor for survey operations in the South China Sea off the Mekong Delta coast of South Viet Nam. She returned to the coast of South Viet Nam and to the Gulf of Thailand in 1967 and 1968. Following survey operations in the Western Pacific early in 1969 and with long and distinguished service to her credit, Tanner began her decommissioning process 14 July. She was struck from the Naval Vessel Register 1 August and transferred to the Maritime Administration for disposal. This page was last modified 17:53, 8 June 2009.